A team from Shacklocks have taken part in the 2017 “Mansfield Big Snore”, raising an amazing £833.70 (plus gift aid contributions!) for Framework, a charity dedicated to tackling the causes and consequences of homelessness. 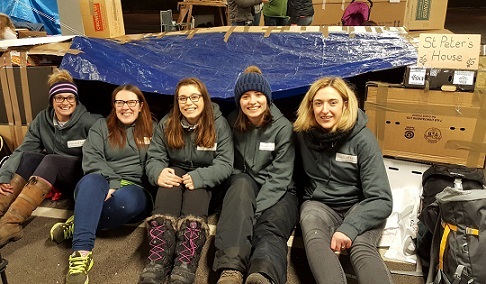 With their Shacklocks’ fleeces, and shelters made from old cardboard boxes to help keep them warm, Rebecca-May Fido, (Trainee Solicitor), Clare McShane (Partner), Lyndsey Hufton (Intervention Accounts Manager), Allysha Laven (Administration Assistant) and Claire Coles (Trusts & Probate Executive), slept out overnight to raise the funds for Framework. The Big Snore took place in March and the temperature was close to freezing. All funds raised by The Mansfield Big Snore were donated specifically to help people in Mansfield.